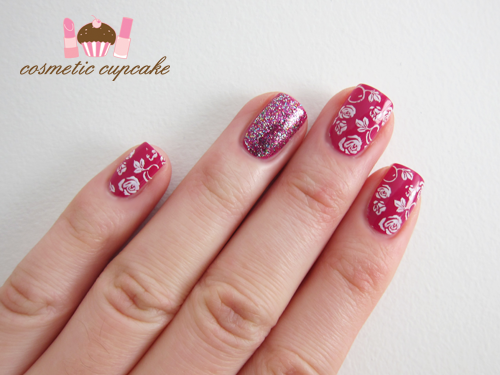 Another day, another rose manicure for you ladies!! Seriously I am obsessed with roses haha. I guess because I don't get them often enough in real life I try recreate them on my nails *hint hint* Just a quick mani I did this week using one of my favourite pinky/plum colours - OPI Dim Sum Plum from the Hong Kong collection. I started off with an underwear coat of Misa High Waist Hue to prevent staining. I then used 1 coat of Dim Sum Plum on all fingers. You can see my swatch and review of it in an earlier post here . I applied 2 coats of OPI Show It and Glow It! to my ring fingers as an accent and stamped full rose image from Konad plate m65 using Konad Special Polish in white on all other fingers. I'm still super busy at the moment so my apologies for my lack of replies to comments etc. I have such a massive backlog of posts =( Can someone please lend me 6 hours extra per day?! Love the roses and the colour! the roses go so well. can you try one the other way around? with the konad plate in pink :)? nice mani!! i love it! Love the roses! Looks so adorable! You did a beautiful job with the stamping! 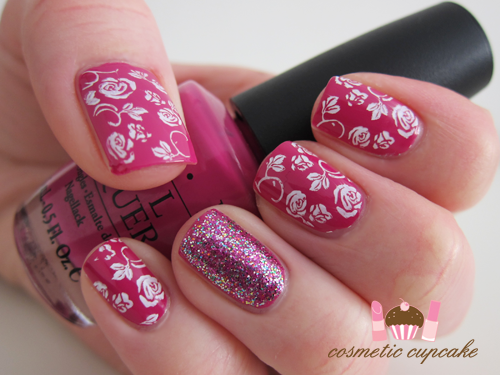 I love this, that stamping pattern is gorgeous. It's lovely! You are an artist! 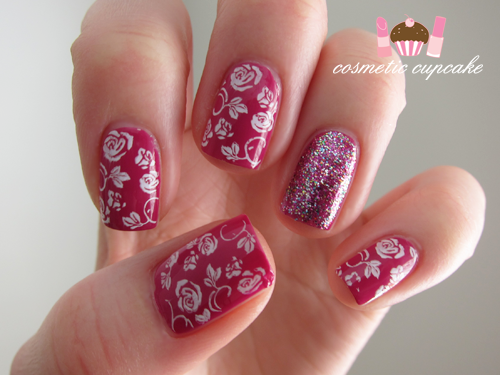 I love that rose stamping plate!